Great Vision! I align with it…how about you? We are on a path of healing, both inner and outer. I believe this path leads to ascension, where we finally and consciously reclaim our divinity, our freedom, our sovereignty. I believe that ultimately this will be inclusive for all who choose it. We have been heading toward it for many, many years, but first all that has been in our way is needing to be dismantled, from our own personal limiting beliefs, habits and patterns to the mantle of deception, power and greed that has governed our planet. It hasn’t been an easy path, and the path hasn’t always been clear. Sometimes the path is as easy to walk, clearly marked, and level as the paved path in my gallery of pictures. Sometimes that path is rocky, uneven, and requires much adaptation, adjustment, and flexibility like walking through a wash. And often we come across some “boulder” in the way that we need to face. Sometimes the path has signs along it, and we know we are going in the right direction. Sometimes we just need to keep going, on faith and trust, listening to our guidance, looking for glimpses of a sign or a feeling that keeps us on the path, hoping we are indeed still even on the right path. Sometimes our paths are lined with sticky situations, people, conditions and we just need to keep centered in our heart, and balanced, so as to avoid any damage. I used to walk a path in McKinleyville, CA, in the dark. I took my time to learn the path, feel it under my feet, and learn its curves and turns, until I could walk it at night, without light or even the moon to guide me, just feeling it under my feet. I feel that this was practice and preparation for these times. Things may look dark around us, and feel dark within us, but I feel that is because the old is crumbling away. The life and world we have gotten used to, with its focus on fear, lack, slavery, violence, isolation and power over others, had become our norm. No matter how much we disliked it, it was all we knew, so we railed against it but accepted it. Spiritual teachers pointed to another choice but many religions made that out to be something far, far in the distance, unattainable until death. But that isn’t true. It is attainable and humanity is moving toward a new world and new way of being NOW! So please continue on the path, take comfort in the times when the path feels soft and yielding, and trust in a higher guidance when the path feels rocky and unsure. We are almost there! Keep your eyes and your heart on a bountiful, beautiful destiny and we will create it together!!!! My work is to assist others in clearing anything in the way of this bliss. So let me know if I can help you in any way. Thanks for being a part of the world in this powerful time. Thanks for your love and light that brightens the world! I just recorded a guided meditation for Spring Equinox and the upcoming full moon. It is on my Oronjo site. You click on the link, don’t need to join, “buy” the meditation for $0.00, and you can either listen or download it. If you do wish you make a donation, you can put in a different amount than $0.00, but it isn’t required. Hope you enjoy it! Be sure to take time before you listen to it to become clear about what your intentions and heart felt desires are that you’d love to bring forth in your life and for the world. Happy Spring! During my lifetime I have made many leap moves, deciding to move, sometimes not knowing where I was to end up, how I was to pay for it or what I’d do once I got there. I always seemed to “land on my feet”, but sometimes needed some back up and my Mom was always willing to provide that for me. In Oct. 2012 I was guided to leap from Seattle, once again not knowing where I was to end up, what I was to do once I got “there” or how I was to pay for it all. Given that my Mom died in 1999, this leap was scarier than ones in the past but it was clear that it was scarier to stay in Seattle then to take the leap as I was guided to do. So I leapt Nov. 1st. Every year I do something special for my Mom’s birthday and her death day. I arrived home from work the night before my Mom’s death day in Oct. 2012 to a package from an old friend. Inside were the three gold bracelets of my Mom’s, that I had given her after my Mom had died. At first I felt upset that she would return them, even though the note suggested that I might need them to sell for cash. In the middle of the night though, I woke up to the understanding that this was actually my Mom’s doing, reaching out to me from beyond death, to support this leap of mine. When she was alive, she would worry quite a bit about my leap moves and become critical at times, wanting me to settle down and lead a more “normal” life. So to receive her support this time, after her death, was quite stunning. The other confirmation I received was on her death day. I was working most of the day and was dreaming all day of at some point grabbing a great high protein breakfast at the cafe next to my work. I ended up receiving an extra client, so my time for eating became shortened. I went next door, asked what they could make for me in a shorter time, so I could eat and be ready for my next client. We decided upon biscuits and gravy, something I had never had before. Amidst sitting in my room eating them, I remembered that my Mom loved biscuits and gravy. So once again she had reached out to me to validate we were connected and I was being guided. I thought of just keeping the bracelets, traveling with them, saving them like a savings account, to use in the future if needed. But I decided to take them to a local store that purchased gold, to get an estimate for what they were worth. The store had a good reputation so I thought it would be good to check things out. They tested the marked 14 kt. Gold bracelets and determined that only one was truly 14 kt. gold and the other two were less than that, gave me an estimate and informed me that gold prices fluctuate so I couldn’t count on getting that estimated amount if I sold them later. I took the estimate and left. Before leaving town, I decided to sell them to the trusted store, took them in, they re-tested them as 2 of them being 14 kt. gold and one less than that, gold prices had gone up, and so I ended up with more money than the previous estimate. Again, I had received another validation of the guidance and support my Mom was sending on to me. My trip hasn’t turned out the way I had envisioned it, has gone on way longer than I had planned for, with more challenges than I had expected and yet, it has been filled with some great learning, much healing and some very pleasant surprises…..plus great scenery! So as my time has gone on, and I still haven’t been led to my next home base, or the next leg of my spiritual mission, I was beginning to get a little worried. During this time, I went to visit an old friend of my Mom’s. This woman is well to do, lives in a gorgeous home, all of her children live a more traditional life, and so I wondered what she would think of my nomad life and uncertain path. During our visit, she handed me what she called a charm, saying that my Mom had given it to her and that in her recent clearing out processes, wanted to give it to me. I took the little package, not really looking at it closely or noting its importance. During our conversation she suddenly announced how brave and courageous she thought I was for doing what I was doing. I was quite pleasantly surprised by this statement, as it was so unexpected. Then she said “And you know, your Mom is listening to this conversation”, as she has had experiences with visits from people after their deaths, too. A week or so later, I took a better look at this “charm” and realized it was the Saint Christopher’s medal that my Mom had always worn around her neck. I had given it to my Mom’s friend after she died. Saint Christopher is the Catholic saint who protects you during your travels. So once again, here was my Mom speaking through her friend stating I was brave and courageous to be on this journey and I am protected along the way. We are all on a journey right now, whether you are remaining in jobs, relationships, situations as before, or leaping like I have been, as we all are in the midst of leaving the 3rd dimensional world of duality, lack, struggle, enslavement to the limitation we have been taught to believe in; and moving into sovereignty, freedom and abundance of the 5th dimension and beyond. We are letting go of all the old ways of living and believing, just as the outer forms of government, finance, competition, and separation are falling apart. We are in the process of shedding all the lies and becoming/uncovering the truth of our divinity, the power we have as co-creators of this world and our lives. I would like to remind you how brave and courageous you are and that you are indeed supported on this path, every step of the way. Yes, the path is barely visible at times, has ups and downs, and blind curves so it can feel scary and challenging, but the light is here now, within us, all around us, guiding the way. 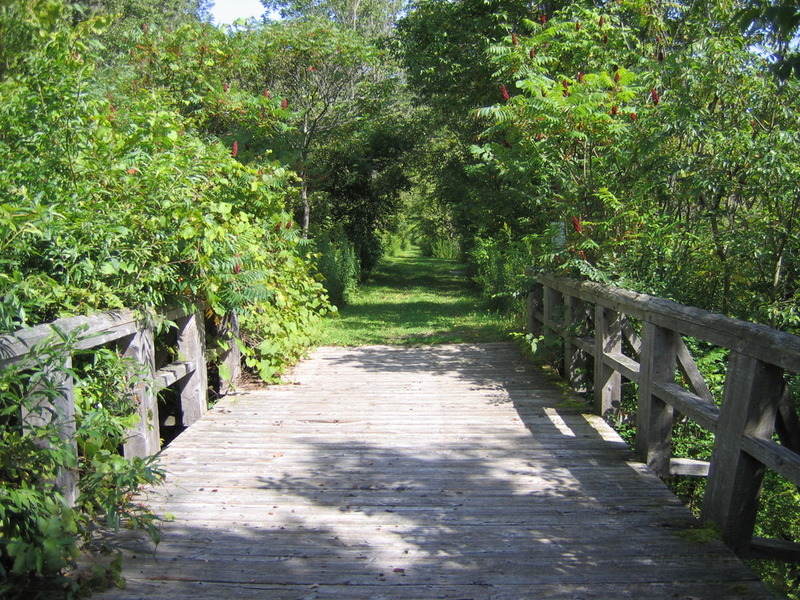 We are crossing the bridge now, feel it underneath your feet, trust in the path and look for some “markers” along the way. And then, take a deep breath, let go and allow yourself to be lifted up and carried to your true destiny. If I can help you in any way, please let me know. Many blessings to you on your journey! Together we are changing the world!